Some of the best camping recipes are simple but when cooked over the campfire are as exciting as the trip itself. The food that you cook will vary according to what kind of cooking facility which is available. Many of the parks and campgrounds have grills available for use; and sometimes even the firewood. This should be checked out before going so you will know what to pack; charcoal, lighter fluid, matches, grill etc. It will be bad to arrive and plan to cook your food but have no fire to do so. The best camping recipes are the ones which you cook at the campsite, especially for children; but much of the prep work can be done at home to make it easier. There is something special about the atmosphere of campfire cooking to enjoy good food. The most important thing to remember about campfire cooking is to protect your perishable foods. Depending on your camping situation, this can be done by packing food in ice or you may choose to use freeze dried foods or dried foods. Packing canned foods and making meals from these are also good choices. Whatever is the case just be very careful not to consume bad food; this will ruin your whole camping experience. This is by far the best tasting rolled rump roast I have ever eaten. Many years ago, the men at our church cooked it at a picnic. It is well worth the effort! Dig a large hold in the ground and fill it with charcoals. Light it and get the coals very hot. Coat the rump roast heavily with prepared mustard. Then pat salt into the mustard until it won’t hold any more salt. Pull some of the hot coals off of the pile to the sides. Lay the meat directly on the hot coals. Pull the coals at the sides back onto the roast. Make sure all of the meat is covered by hot coals. May need to start another pile of charcoal burning to replace some that burns out. Keep hot coals covering the meat until it is done. Use a meat thermometer to check for doneness. Rare is 140 degrees-Medium is 160 degrees-Well done is 170 degrees. When the roast has reached the desired temperature, move roast to a tray. Remove black crust which has form around entire meat. Slice against the grain. Many of the best camping recipes are chicken dinner recipes. The following is one of the chicken dinner recipes which can be put together at home in foil, packed in ice and cooked on a campfire. By using your imagination ingredients can be changed and new meals created. This can be prepared at home and transported in a cooler. Cut two pieces of heavy duty foil (12x15 inches) for each person’s serving. Lay one piece on top of other to make it a double layer. Lay a chicken leg and thigh piece on each double layer foil. 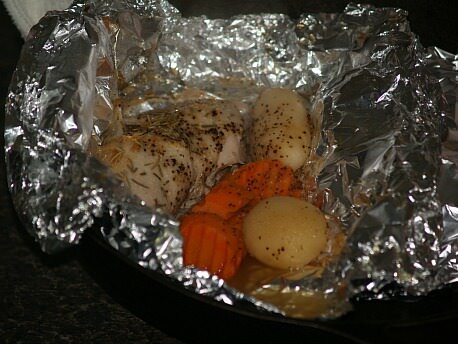 Add 2 small potatoes or 1 large cut in half, to each foil. 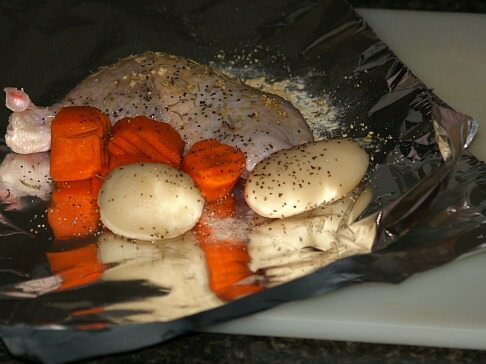 Add 3 to 4 large carrot chunks to each foil. Spread a little butter over the potatoes and carrots. Sprinkle the chicken and vegetables with salt, pepper, garlic powder and rosemary. This recipe is one of the best camping recipes but it takes more time to cook than your average campfire recipes. 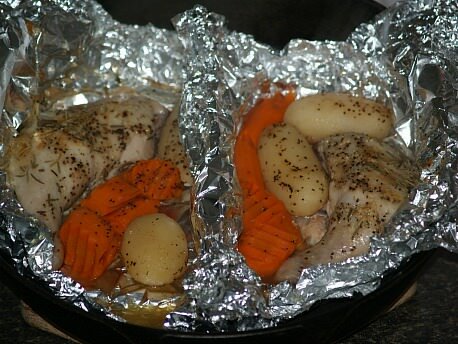 Wrap foil around dinner and seal tightly. Place on a hot grill and cook for 30 minutes on each side or until all is tender. This is another one of the best camping recipes which can be prepared at home, iced down in a cooler and cooked on the campfire. The work is done at home, just place dinner on grill and enjoy the campfire cooking. This can be prepared at home before leaving on a camping trip and transported in a cooler. Lay out 4 sheets of heavy duty foil. On each piece, place 1 fish fillet and 2 shrimp. Then place on each ¼ of the bell pepper, 2 asparagus spears, ¼ of the sliced onion and 4 grape tomatoes. Sprinkle 1 teaspoon of lemon juice over each. Sprinkle each with salt, pepper, garlic, dill and parsley. Wrap each packet securely. Cook on a hot grill for 20 minutes or until fish flakes and is done. Who would think of having sausage and cabbage for best camping recipes! This is a great alternative to traditional camping recipes. So easy and delicious! Lay out 4 Pieces heavy duty foil. (14x16 inches) Divide shredded cabbage among the 4 pieces of foil. Lay ¼ of the sausage pieces on top of the cabbage. Put 2 of the potatoes on each foil. Pour ¼ cup of salsa over each and then sprinkle with a pepper. 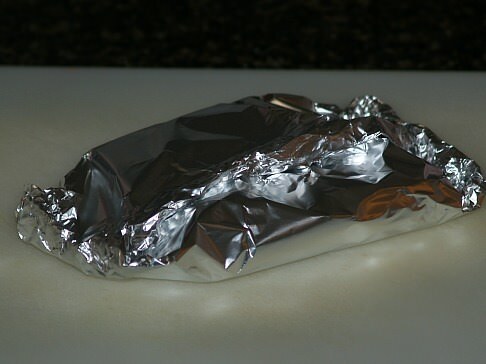 Wrap foil securely around dinner. Cook on a hot grill for about 30 minutes or until vegetables are tender. This is another of the best camping recipes. It is made in a Dutch oven and can be precooked at home on the stove or in the oven. If you choose it can be precooked on a grill burner. Place pork chops in Dutch oven. Add 1 cup water, brown sugar, onion, garlic powder and seasoned salt. Simmer on burner or in oven until tender (about 1 hour). Pour over pork chops and return to heat; heat thoroughly without boiling. Use 10 briquettes on the bottom and 15 on the top. Place meat in a container with lid. Mix together olive oil, lemon juice, wine and garlic; pour over meat. Sprinkle with salt, pepper, oregano and bay leaves. Place vegetables on top of meat. Weigh mixture down with a heavy plate; wrap tightly and refrigerate for 24 hours. Cook over glowing charcoal about 20 to 30 minutes (Or to desired doneness) while basting with marinade.